It’s okay to ask for what you want! 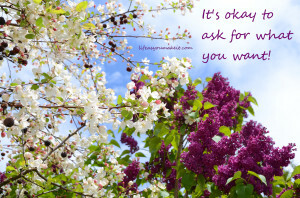 It is okay to ask for what you need and want! Many people know this from the start, many people take it too far, and some of us don’t honor our needs or wants at all. From the time I was a child, I was shown and told that my needs and wishes did not matter. Everything was about my parents’ needs. So, I learned to shrink into the background and meet everyone else’s needs…while ignoring my own. I would fear doing anything that was the least bit inconsiderate of others, (or in my very humble mind, even seemed inconsiderate.) For example, if I needed to use the restroom during class, or at a movie, or somewhere in public, I wouldn’t. I wouldn’t ask, and I wouldn’t disturb others no matter how badly I needed to go. I thought it would be rude. In my college dorm room, I listened to my radio very quietly so I wouldn’t bother anyone. I was always hyper-conscious of not bothering others or asking others for anything. With my first spouse, I gave him the big closet in our bedroom and I used the little one in the spare bedroom. I also gave him the big bathroom so I could use the little one. I always put myself last. In relationships, I would give, give, give, but feel guilty or selfish about asking for what I needed–or even equal treatment. But the reality is, it is NOT wrong to ask for what you need or want. Of course, you can’t force the person you are asking to give you what you need or want, but there is nothing wrong with expressing your needs. Now I’m not saying we should run around demanding luxuries. 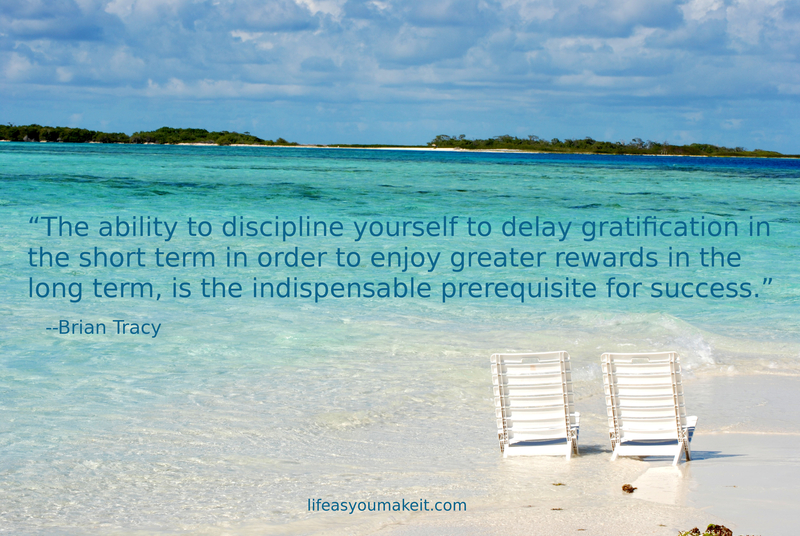 I’m saying we shouldn’t feel guilty about taking care of ourselves, or even wanting fair treatment. Getting your needs met or even some of your wants is not spoiling yourself. It’s honoring yourself. I used to feel guilty for “splurging” on medical care when I had credit card bills to pay. How backwards! I should have put my health and my body ahead of being a good consumer! When I first got divorced, I decided to treat myself like I mattered. No more putting myself last. I bought some nice perfume, got a new haircut, and started taking lots of relaxing bubble baths to de-stress and feel good about myself. Crazy how it took me 30 years to realize I was allowed to do that–that I didn’t have to hide in a corner and disappear while others met their needs and desires. These days, I feel less shy about stating what I need and taking care of myself. 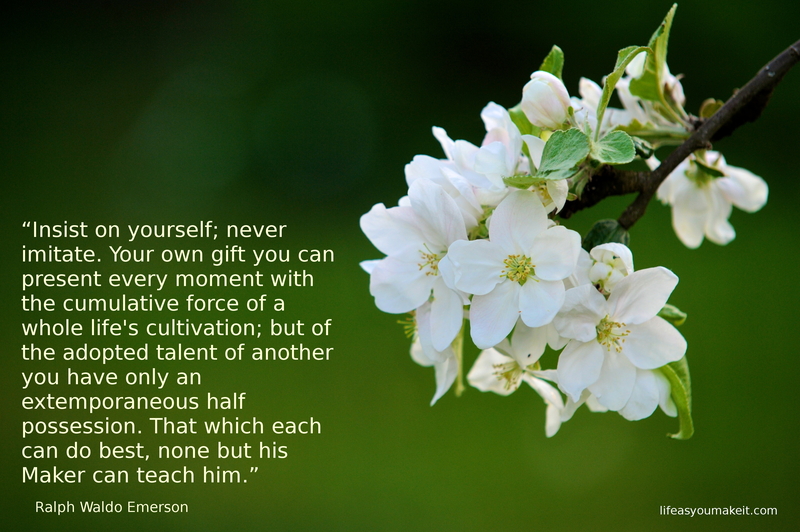 What an important lesson to learn! A few years ago, I noticed a frustrating phenomenon in my jobs. I was consistently the hardest worker, I won achievement and performance awards, and I got great reviews…but people with less experience and smaller results were promoted to management positions ahead of me. Why was that? Isn’t doing the best work the way to get to the top? Sadly, it isn’t. 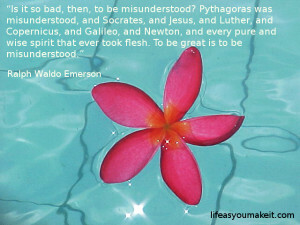 In fact, I think sometimes that being the best is a sure way to get stuck in one place! I got to talking with a girl who was a bit younger than me, who went to the same university and had a less challenging degree with less experience, and yet made far more money. I told her about my problem and asked her if she had any tips. She did! She encouraged me to promote myself more and make sure my bosses saw my achievements. At first, I thought this was weird. Why would I show them the obvious? But, I am open to learning from others, so I tried promoting myself a bit. I was in the habit of alerting managers and supervisors when things went wrong at work or if I noticed things that needed improvement, but that wasn’t getting me anywhere. So one day, I sent an e-mail to the director instead. She was excited by what I had to say! Within a few weeks, she had invited me to go on a business trip to a sister-company to share my views and experiences. Soon, I was invited to go out to lunch with the vice-president of the company thanks to my performance…and the fact that the director had noticed me. But, she had noticed me because I put myself out there. It was quite a lesson learned! I was re-reading Napoleon Hill’s “A Year of Growing Rich” recently and one of the chapters reminded me of that lesson I’d learned. In Hill’s book, chapter 14 emphasizes showmanship and getting noticed. He uses an example of an employee who works hard and gives much of his own time, but watches less devoted employees get promoted ahead of him. (Hmmm…sounds familiar!) Hill recommends exactly what my peer had recommended. He says that we need to recognize others and let them see us, but in a sincere manner rather than just showing off. I know from first-hand experience that it works! Don’t settle for other people’s choices. Make your own! 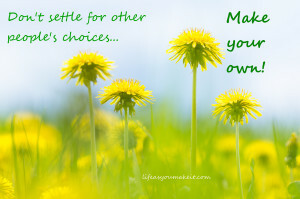 I have realized that I have a problem with settling instead of respecting my own desires and needs. I do this all the time! I have told myself it’s because I’m good at compromising and caring about others first, but I have come to realize I take it too far until I don’t care for myself at all. I can’t count how many men I’ve dated just because they asked me out, and I thought I would be nice and accept. Even when I knew these men had qualities that I didn’t really care for, I have never been one to turn a person down because of some characteristics. (Assuming no drugs or crime or really obviously bad things.) For example, I used to date a man who was in his thirties and lived with his parents and had no goals. He worked as a bagger part-time in a grocery store. At that time, I thought I was being very open-minded and accepting, but…I ended up supporting the guy for years while I worked and he spent the days having fun in the sun and spending my money! Another time, I dated a man to whom I had no attraction, and with whom I had very little in common, because he kept pushing and saying how much he liked me. Well, how about whether or not I liked him? I didn’t take MY thoughts into consideration. I just went out with him thinking I’d give him a chance and maybe I’d find out I did like him. (By the way, I didn’t.) I have been open-minded to differences, bad habits, and more because I wanted to be caring and accepting. I have been willing to compromise in ways that others haven’t. How many of these people would be so open and boundary-less in return? None. I can’t decide if this makes me a nice person or a sucker. I’m leaning a bit toward sucker. Not that it is bad to be accepting, but I need to be aware of my own needs in situations, and all too often, I’m willing to throw my needs away. I have done so many things I didn’t really want to do just to be nice to my friends or even acquaintances. Many times, I have done things for people that they’d never think to do for me in return. 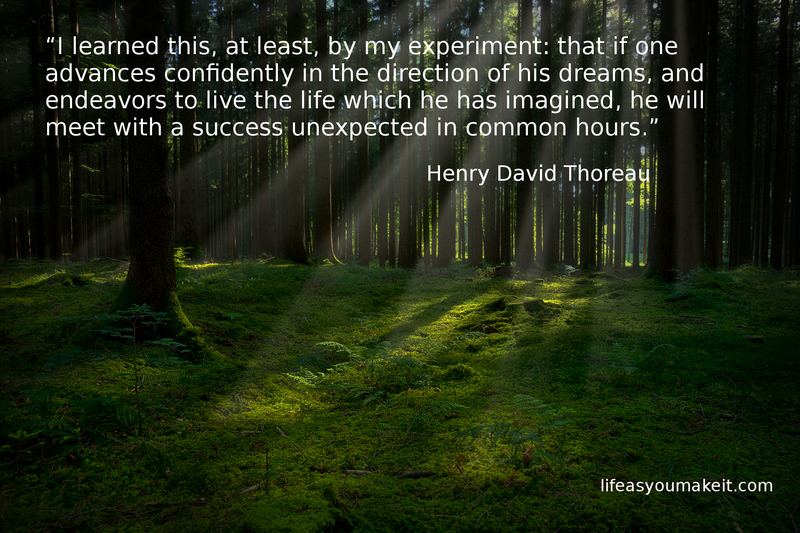 Too many times, I have lived my life based on what others dragged me into rather than just making my own decision. There are things I want in my life for sure, and things I definitely do not want have in my life. Then there are most things that aren’t essential either way. I think it’s about time I got choosier and insisted on meeting my top desires instead of just following others towards what they want and letting them pick for me. I need to stop mixing up reasonable compromise with neglecting myself! 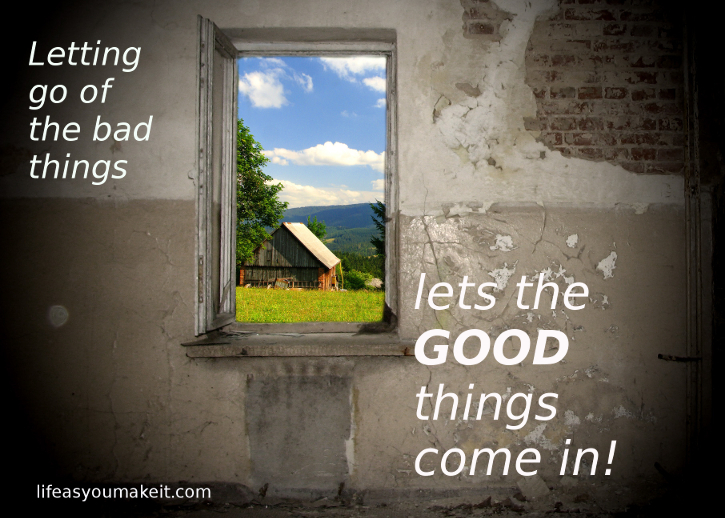 Letting go of the bad things lets the good things come in! Until recently, I was dealing with a situation that was making me miserable. I wanted it to be a good situation and I felt like there was potential for it to be a really great place for me, but what I wanted was not what was. I realized I was being co-dependent with this situation! When you are in a toxic codependent relationship with a person, you often keep trying to “fix” them and get them to treat you better, but it’s a dead-end. Well, I was doing that with a situation with a group of people rather than a person. I had enjoyed many good times within the group but it was a situation that was destroying my ability to remain positive, and trying to fix the situation was sucking up a lot of my time. 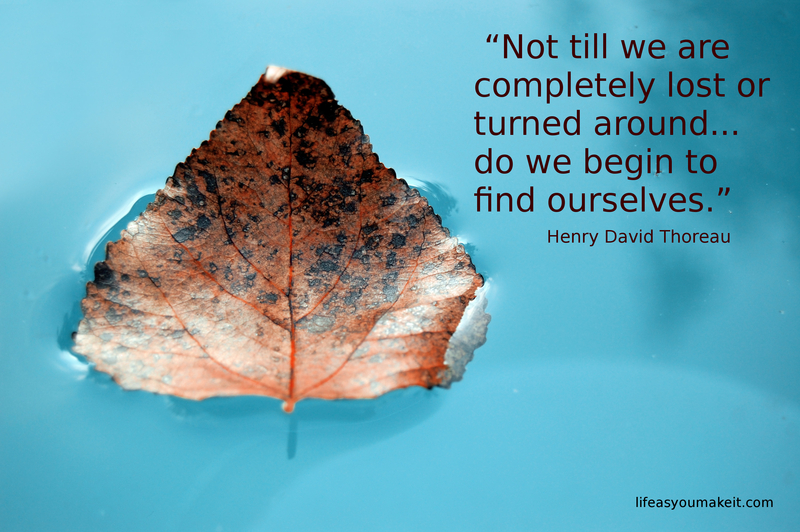 So I took the leap and said “no more.” Maybe this situation has potential, but it is not good for me now, and I’m driving myself crazy trying to fix it. I sadly said “goodbye” and realized I needed to move on. Within a week, a better situation came up for me! It truly was a case of closing one door and having another open for me at the right time. 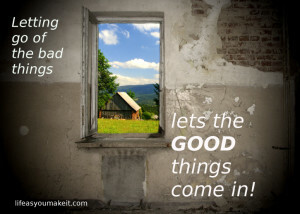 This has caused me to remember various cliches about God closing a door but opening a window, removing the bad to let the good come in, etc…. How many of us are missing the good things that could happen for us because we are so busy trying to make the wrong things fit where they don’t belong? I’m not saying we should give up on everything that annoys us, but if you have a bad situation in your life that is doing you more harm than good, it may be time to move on. Remember, you can’t fix others; you can only fix yourself. Good things can be out there for you if you go find them! Five science-based ways to lift your mood quickly! 1. 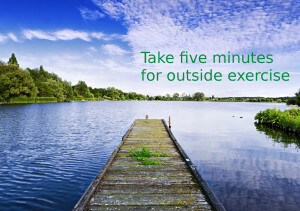 Take five minutes outside to exercise. This study found that just five minutes exercising outside helps lift your mood. It works even better if you are near water. 2. 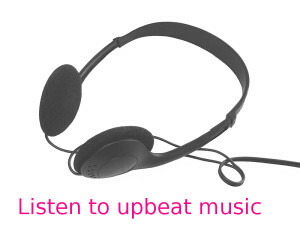 Listen to upbeat music. Many studies have shown that music can improve your mood. 3. Cuddle with your cat or dog. 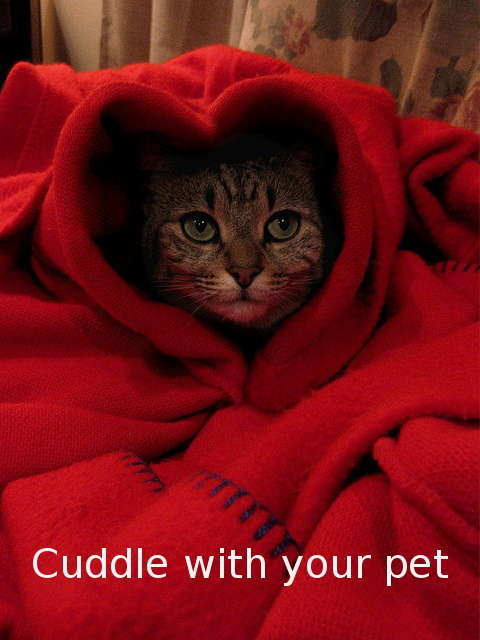 There are many health benefits to caring for a pet. 4. 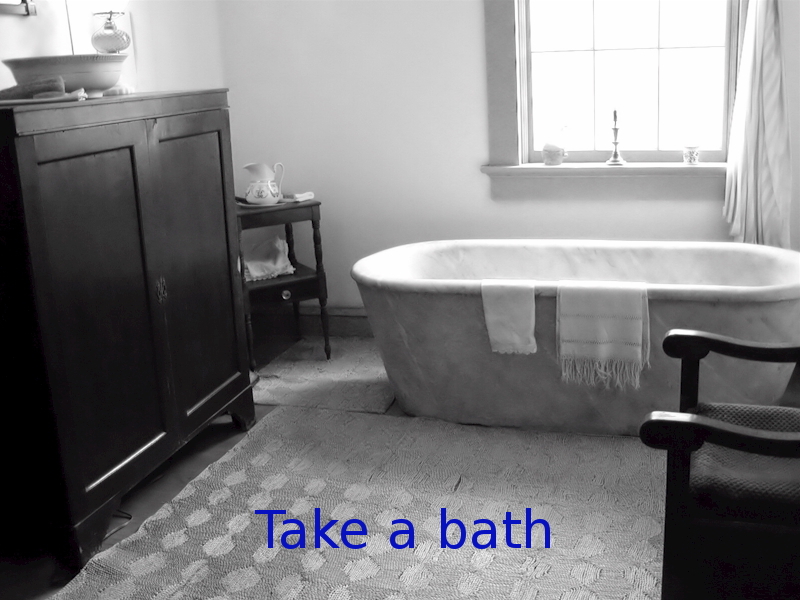 Take a bath…and wash your worries away according to this study. 5. 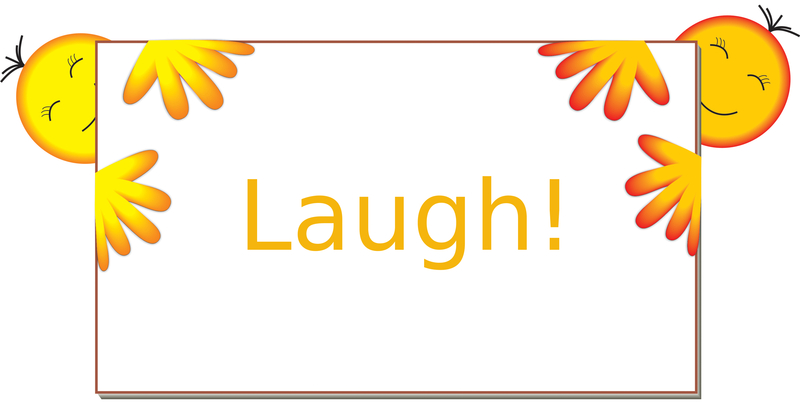 Watch a funny movie, read some jokes, have some fun. 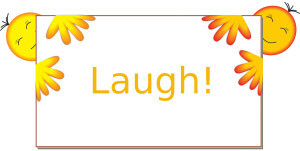 Laughter is proven to reduce stress and improve your health. I like to browse the internet for new ways to feel good and inspired and I came across this interesting article the other day. Apparently, research shows that showers and bathing can actually make people feel like they have washed away their guilt, depression and worries. I have always enjoyed taking a nice bubble bath or a hot shower to de-stress, but it turns out that it might have been helping my moods more than I thought. According to this article, people can literally feel like they are washing their problems or bad luck away. They feel more moral and less guilty after using anti-bacterial cleansers. Interesting! Years ago, I had an unusual doctor who treated me in the typical way as far as giving prescriptions, etc…, but she also gave advice about alternative treatment. 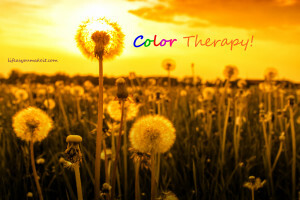 For example, she recommended using aromatherapy products to brighten my mood or reduce stress and she recommended color therapy as well. She asked me what kinds of colors I liked to wear, and what colors I used to decorate my house. I told her I used a lot of earthy colors like green and brown, and she pointed out that I didn’t have a lot of reds or oranges in my life. That is true. She gave me a maroon-colored silk sample and suggested I just enjoy the color of it, as well as trying to add more reds in my life. She thought it would help me feel less depressed and more energetic. I’m not sure how true this is, but I liked the idea of adding more variety in my life, so I’ve kept her advice in mind. When I buy decorations for my home, I try to find things that match my colors but also have reddish highlights. If nothing else, they are pretty, right? Tonight I was reading through some psychology studies and found this article. Now, this is a study based on hamsters, so the article warns that it might not work for humans, but it does give us something to think about. The article found that at night, it’s best to have total darkness, but if you do like a night light, you maybe best off using a red night light instead of clear or blue. Hamsters that had red night lights at night were less depressed. The researchers concluded that people who work third shift may benefit from red-based lighting instead of white lights. Of course there is a stigma to using a red light 😉 but reading this study reminded me of the maroon silk sample my old doctor gave me. It’s interesting advice to use red-colored items to avoid depression. 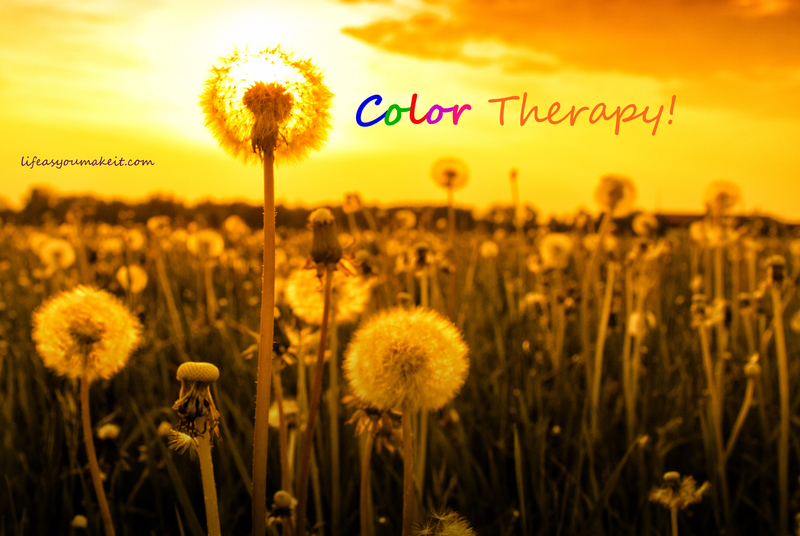 Maybe there is something to color therapy….